This item really takes the cake ... and takes it to a whole new level of style and sophistication. Great for baked goods, our round organic pearl nova plate in the new PEDESTAL Collection is also an elegant surface on which to serve cheeses, canapes or other little bites. 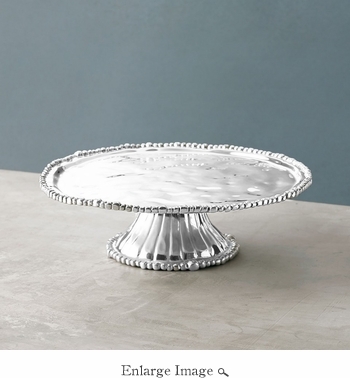 Pair it with any of our ORGANIC PEARL or PEDESTAL pieces for a shimmering tablescape. From the PEDESTAL Collection. Made of an FDA safe, easy-care 93% aluminum alloy. In a world of mass production, handmade is the true luxury. Size: 15" x 14.50" x 3.25"